I was not informed at any time about my court date. I'M RUSHING TO COURT and was not told what has happen to MY OWN CHILD! I am being informed later the rights to my child TODAY is being terminated! I have called my lawyer.No call back.No one is telling me what is going on with my own case." No one has informed me of my court date and now i am learning my rights are at risk of being permanently terminated. >Wrongful removal of my child who was injured only after the seizure by C.P.S. >Lies under oath to a material fact. 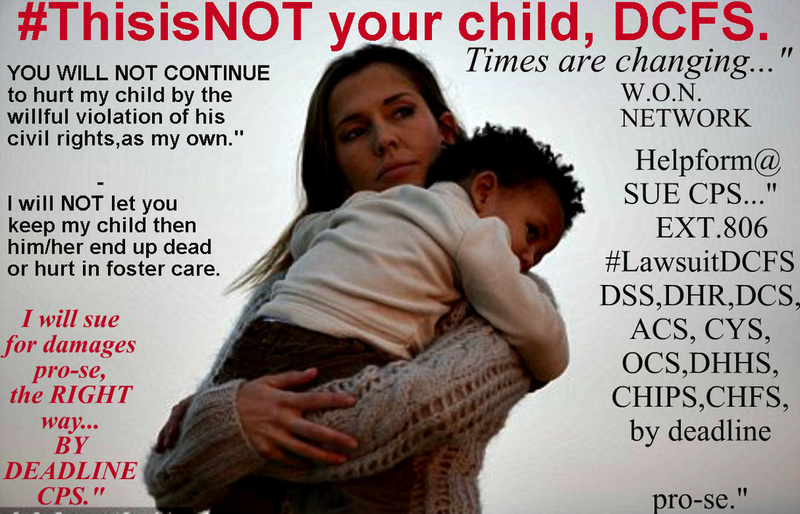 NO LAWYER I HAVE CALLED HAS HELPED ME,and my DEADLINE TO SUE per employee/cps employee,dcs,dfs,dcpp,dyfs,dcfs,acs,dss. My DEADLINE is almost up. I was informed i have no rights and i cannot find "1"caring lawyer to sue." 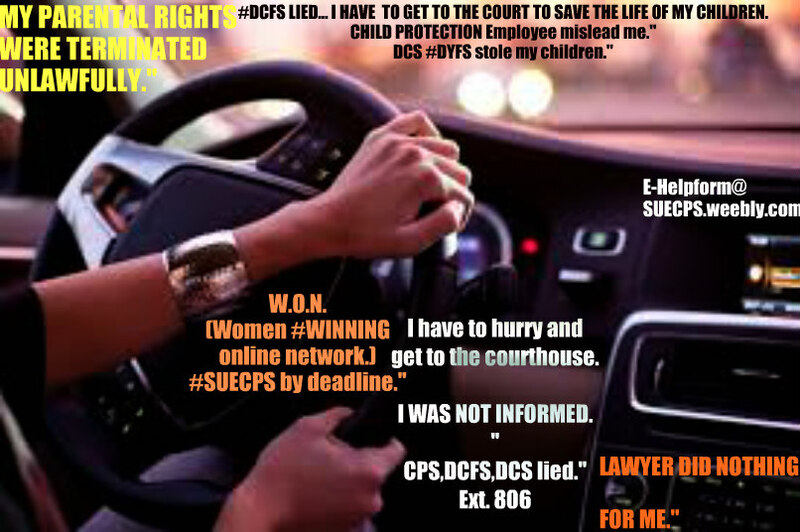 If i do not sue, by pro-se method(self file) then CPS gets away with the severe harm i am suffering from.I have to at least "try" and hold Department of Children Services, Department of Child and Safety accountable. I will file my lawsuit by DEADLINE pro-se. "I will file my suit against C.P.S. ​by deadline and not only file it, but i will #LEARN in a timely fashion, to do it the right way."